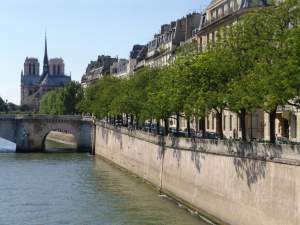 Cité (line 4) – Hôtel de Ville (line 1) – Pont Marie (line 7) – 2 minutes walking distance. 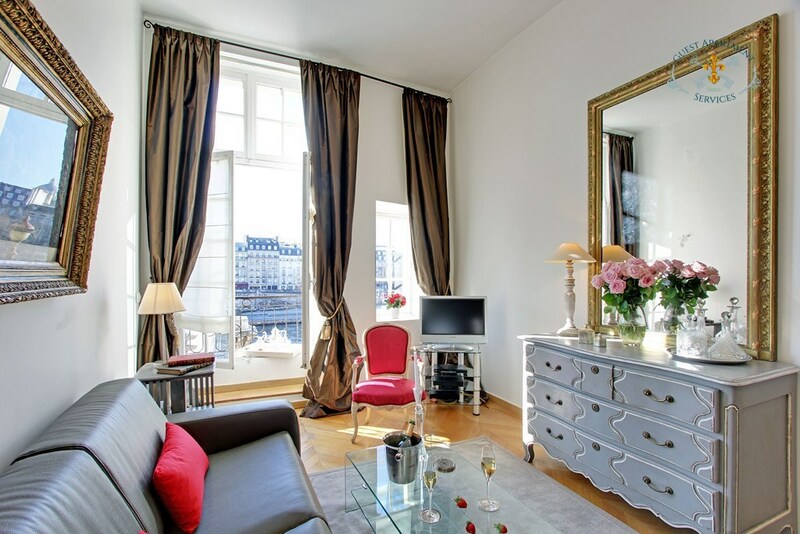 This discreet and self-contained island is one of the most enchanting places to stay in Paris. 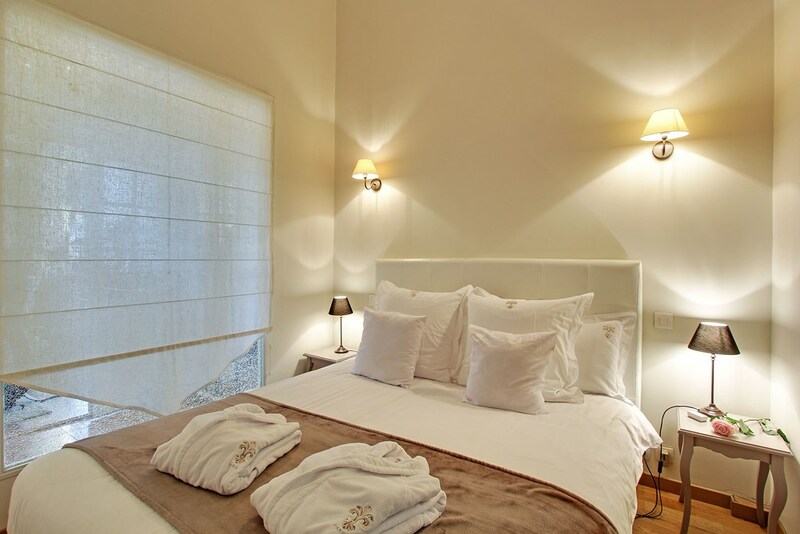 It is delightfully unspoiled and has a mixture of handsome XVII century architecture, modern boutiques, narrow streets and magnificent views from its tree-lined quays. Many of the houses on this prime location, uninhabited until the XVI century, were built for noble families on the quays of what was once called “Ile aux Vaches” (Island of Cows). 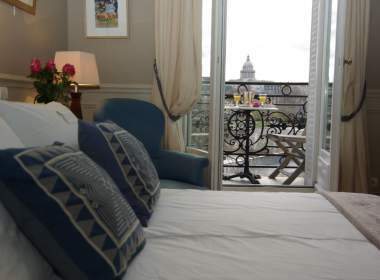 It sits directly behind the Ile de la Cite, a mere stone’s throw away from Notre Dame. Running lengthwise along the island is the main street, Rue Saint Louis en L’Ile. 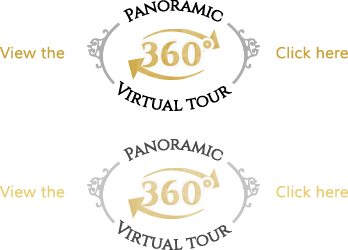 It boasts a baroque church, refined boutiques, old-fashioned bistros and brasseries, delicate chocolate and food shops, a florist, bakeries, a wonderful cheese shop and many pretty teahouses. The island has a village feel about it and after staying in it a day or two, you will be enamored. 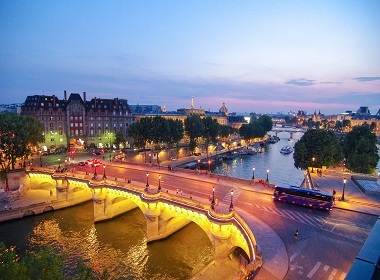 Many of the most important and attractive sites of Paris are located nearby. 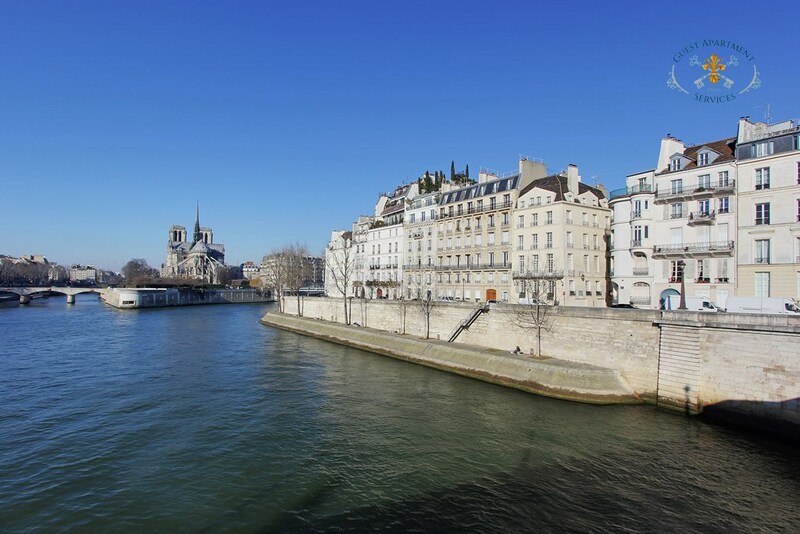 The Pompidou Center, the Louvre Museum, the Tuileries Gardens, Champs Elysees, the Sainte Chapelle, the Latin Quarter, the Bastille & the Marais are either within walking distance or can be easily reached by taking the metro line N°1 on the nearby “St Paul” station. 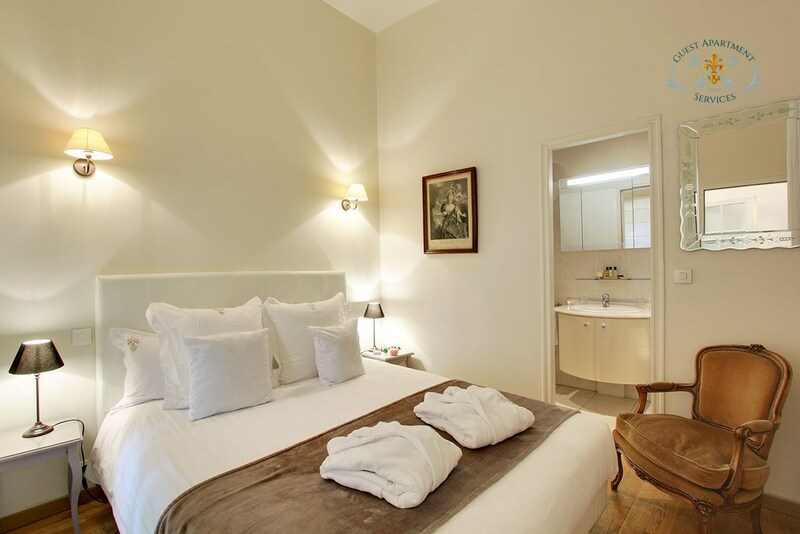 Situated on Ile Saint Louis, this charming one bedroom is located on the second floor of a XVII century building, facing the River Seine. Located in the heart of the Ile-Saint-Louis, the front entrance to this 17th century building leads into a high ceiling’s hallway. After a glass door one flight of stairs leads you to the 1st floor. Upon entering, your first impression will be one of light and warmth. The luminosity is due to the very high ceilings and the tall window. 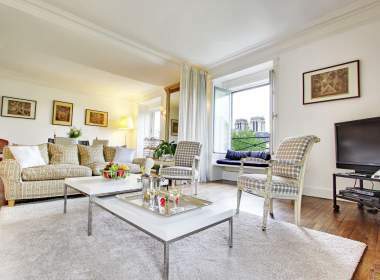 The pale colour of the walls and the large mirrors in the main living area makes it cheerful and warm all year round. In the lobby, a large closet with inset mirrors on the doors provides ample space for stowing luggage and arranging your personal affairs. 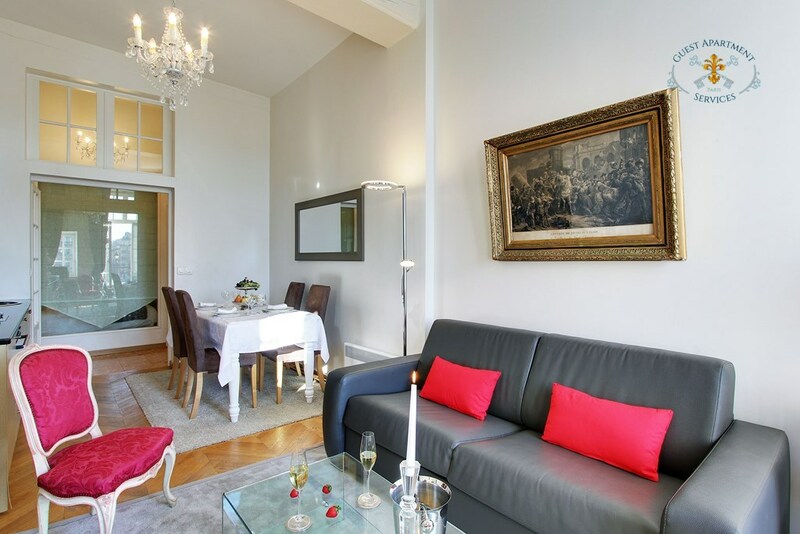 The separate living / dining room is located on the front of the building, from where floor to ceiling window offer you views of the River Seine and the Pont de la Tournelle adorned by the statue of Sainte Geneviève, holy patroness of Paris. It is a perfect spot for discreet people watching. Inside the living room, one is reminded of the age and dignity of the building thanks to the high ceiling and the wooden floor. A combination of small-scale contemporary and traditional French furnishings speak strongly of the style and creativity of the French today. The sofa and armchairs are placed in a manner for sharing conversation and drinks around an elegant coffee table, for enjoying a quiet read in the sunshine or to watch your favourite international news or movies on the flat panel TV. The salon is lit by a chandelier and a series of contemporary style spot lights. 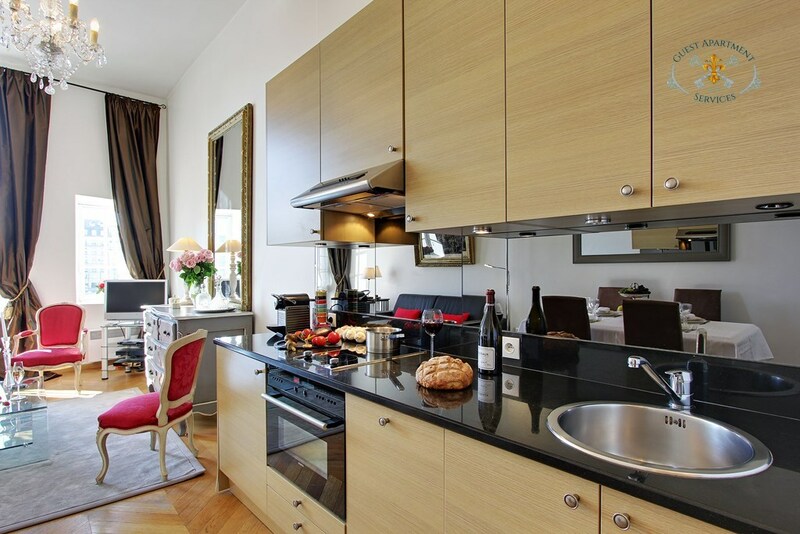 The dining and kitchen areas are cleverly defined by the placement of the furniture. All has been designed to create a very cosy atmosphere. 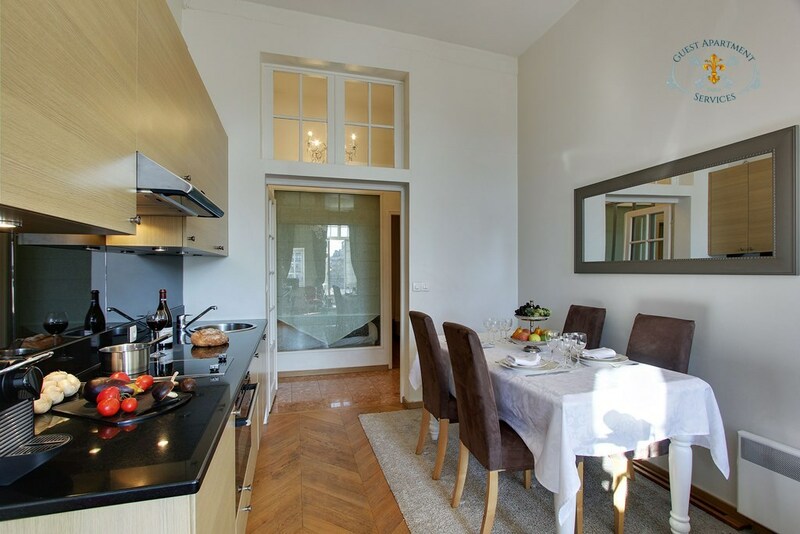 The dining area consists of a wooden table that seats 4 and an impressive mirror on the wall. 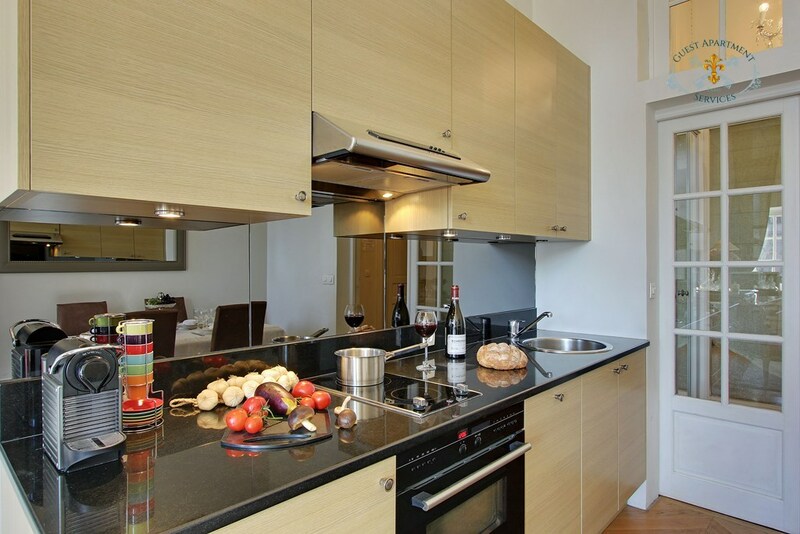 The kitchen area has been carefully designed to add to the comfort of the apartment as well. The built-in appliances (dishwasher and fridge) have been hidden behind the facades. The ceramic stove top and the microwave/convection oven are black to blend with the absolute black granite of the counters and backsplash. Coffee maker, toaster, glassware, cutlery, utensils, dishes and crockery are provided there. 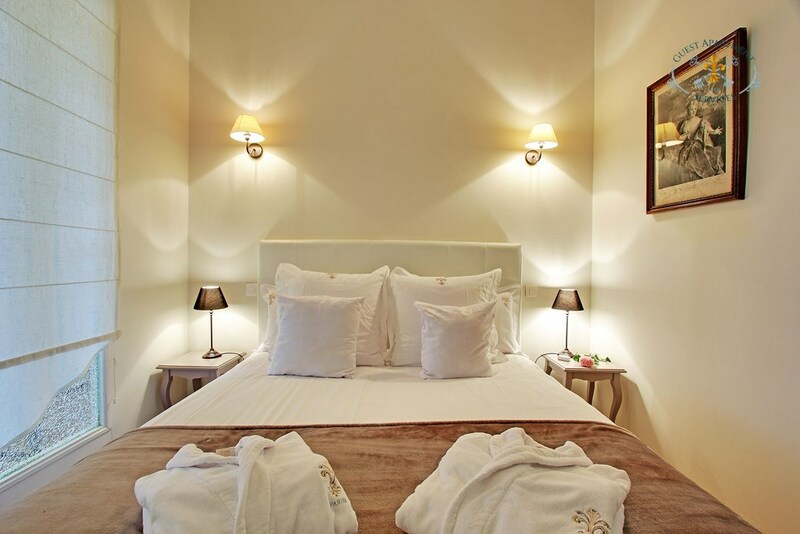 The petite bedroom located in the back of the apartment is a haven of peace and quiet. The window is dressed in pale floor to ceiling curtains that diffuse a soft golden light. A very high quality queen-sized bed and night stands with reading lamps are there for your comfort. 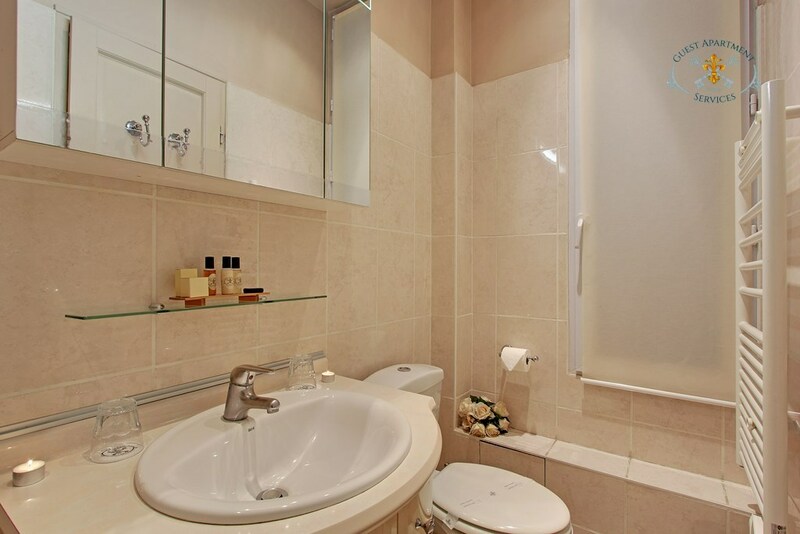 In the bathroom you will find a corner bathtub with shower fixture, wash basin, cabinet and toilet. The floor and walls shower stall and tile in beige tumbled marble style. 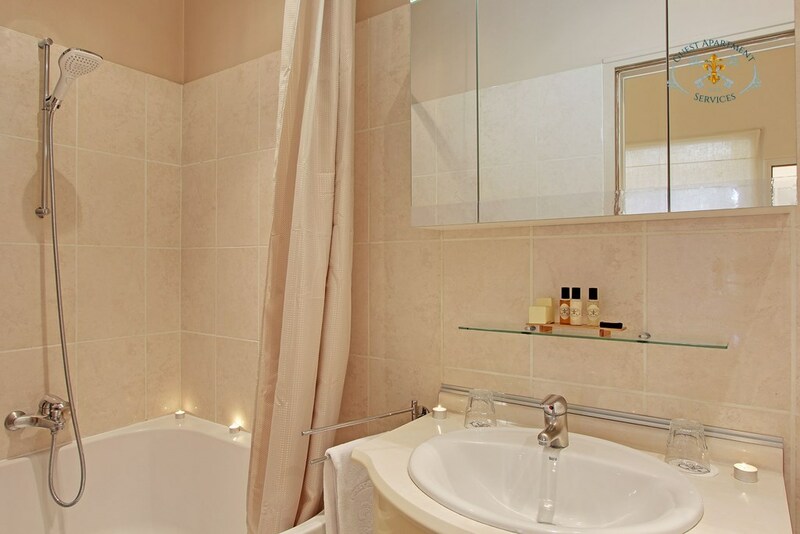 The towel rack will heat the bathroom and warm your towels at the same time. The washer-dryer is located in a separate room accessible in the middle of the staircase. 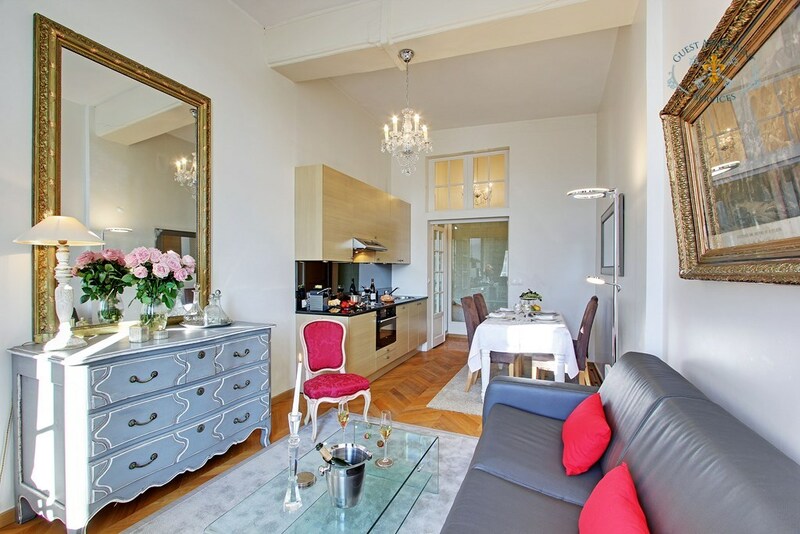 This comfortable, well-appointed one bedroom apartment is characteristic of life on Isle-Saint-Louis. It offers charm, light, warmth and quietude. Your senses will be delighted to be on vacation here as well. Regarding other appliances: A flat screen TV with cable offering the main international channels (CNN, BBC…), Stereo HI-FI system with DVD&CD players. Private telephone line and answering machine available. This property is equipped with WIFI internet with unlimited Free connection. Note: Only residents are authorized to get inside the building. This is a non-smoking apartment. For sanitary and security reasons pets are not allowed. Sleeping Capacity: 2 to 3 Guests. ​An English speaking member of our staff will greet you in our office, upon your arrival, during the week days from 10.30am until 6.30pm.